August 14, 2018 - No Comments! Two words that every eCommerce business should know. Because a referral program can help you stay ahead of the competition. And it can help you get value without having to spend thousands of dollars in tactics that most of the times don’t work. 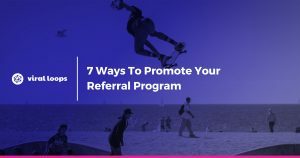 In this article, we are going to see why referral programs work along with 3 powerful tactics you can use to introduce a referral program to your eCommerce customers. We all know that referral marketing works. In fact, it performs better than any other marketing tactic or channel. People are more likely to buy a product or service that is referred to them by a person they know. It’s a universal human trait. But, you are probably wondering why is this happening and when it started. I will share with you one of the most popular examples. It all started in the US of the 50’s, with the popular Tupperware parties. 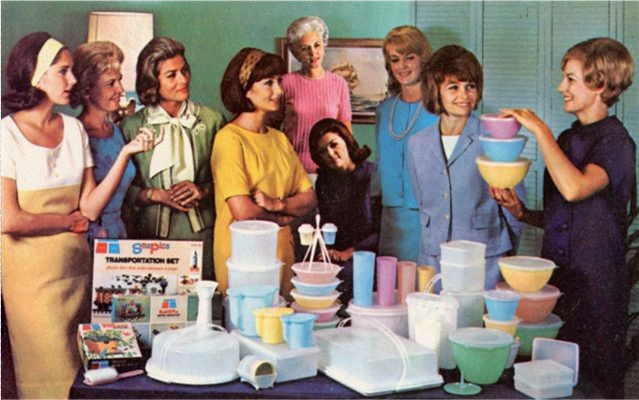 Tupperware parties were hosted mostly by women, at that time, and were simple social gatherings where the host did a presentation of Tupperware’s products. After the presentation, the guests - who were mostly neighbors and friends - were able to buy the products they liked. And, most of the times, they did buy. Keep in mind that everyone in the room knew that the host is going to get a commission out of the sales she is going to make. But, still, everyone had to buy something. It was referred by a person they knew, liked and trusted. Almost 70 years later, referrals still work like a charm. Now, consider it this way: Your eCommerce customers know people who like them and trust them. And you want those people to know about your online store and your products. You can’t do it with a party/gathering anymore; instead, you may use a referral program to drive referred sales. 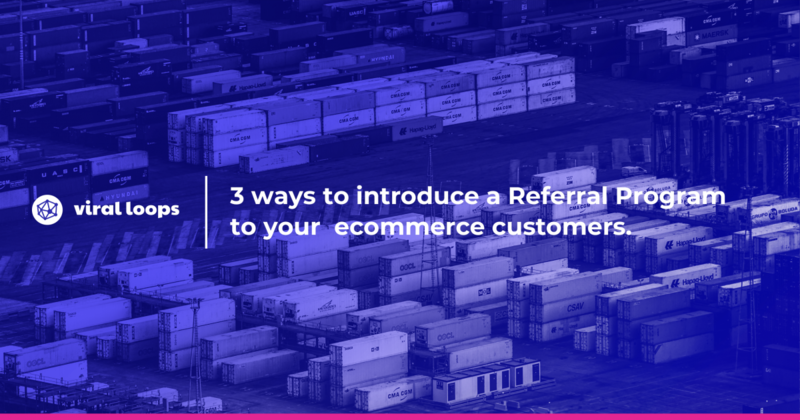 Let’s look at 3 ways you can introduce a referral program to your ecommerce customers. If you are following this blog for a while, then you probably know that in order to ask for a referral, you have to build trust first. In other words, you can’t ask for a referral from a customer who wasn’t happy with the products they bought from you. This means that you have to validate the idea that your customer is happy with your products first. Well, let’s see a really nice example coming from BAMF Media. 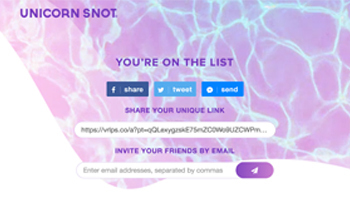 As you can see in the picture below, BAMF Media built a landing page for one of their eCommerce clients, Unicorn Snot. Now, the landing page asked people to join a waitlist for an upcoming product. As you may have guessed, the purpose of the landing page was for people to share their email. If they did, then they received an email when the product would be available. 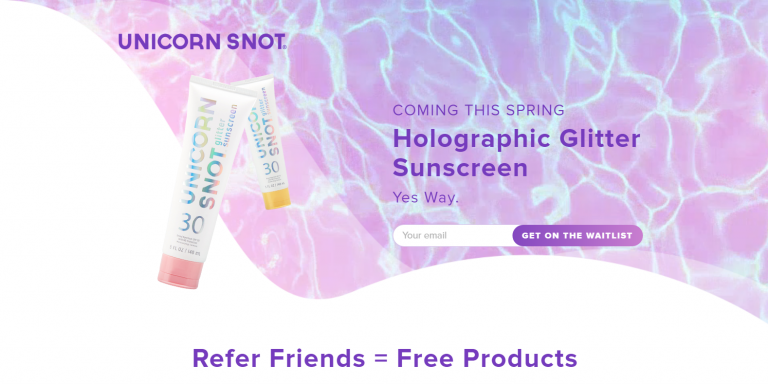 In this particular campaign, could Unicorn Snot ask for a referral right away? They didn’t know that a potential customer was ready to refer their campaign to their - let’s say - friends unless there was a connection between them and the company. That connection happens the moment someone gives their Email. In this page, they were asked - and could - share this campaign with their friends. As you may have guessed, many of the people who signed up shared one of the referral links with their friends. In fact, 48% of them did. So, it is evident by now that building a dedicated landing page is a great way to kickstart your referral program. You have to be sure that people are likely to refer your products or upcoming products. Thus, you always have to ask for a referral on the Thank You page or after you’ve validated that people are happy with your products. 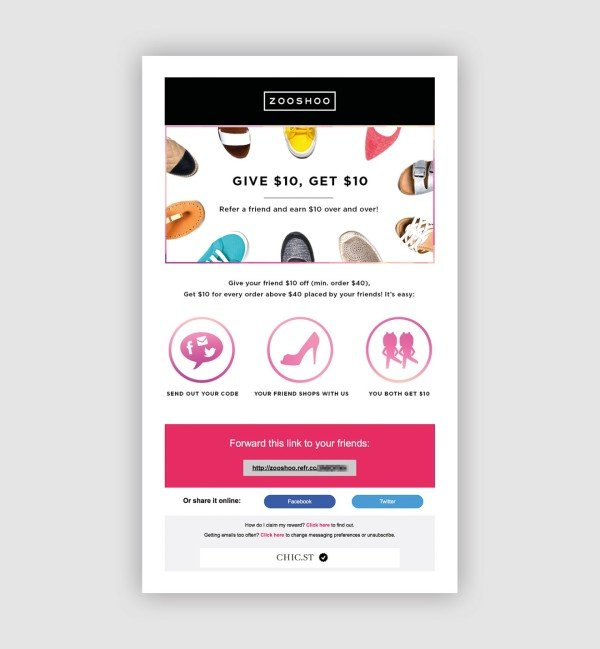 The second way to introduce a referral program to your ecommerce customers is by email. Most ecommerce businesses will tell you that email isn’t working anymore or that they haven’t managed to monetize their subscriber list yet. This is happening because they are too sales-y. They bombard their audience with promotions and offers and don’t add real value to their lives. Just to be clear here, I am not saying that sending promotions and offers occasionally is wrong. All I'm saying is that overdoing it will have a negative impact on your brand’s image and that your efforts won’t pay off. Like with the landing page example, you shouldn’t introduce a referral program to email subscribers who are inactive or don’t bother opening your Emails. What you have to do is establish some benchmarks. 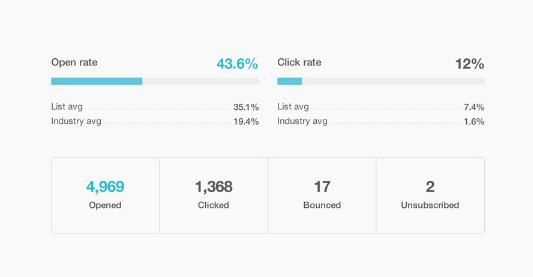 You can do this by start monitoring the performance of your Email campaigns. Monitoring the performance of your past campaigns will help you identify trends and realize what is normal and what is not. Once you are absolutely sure about what is normal for your eCommerce business, you can make a segment of your subscribers and introduce your referral program. 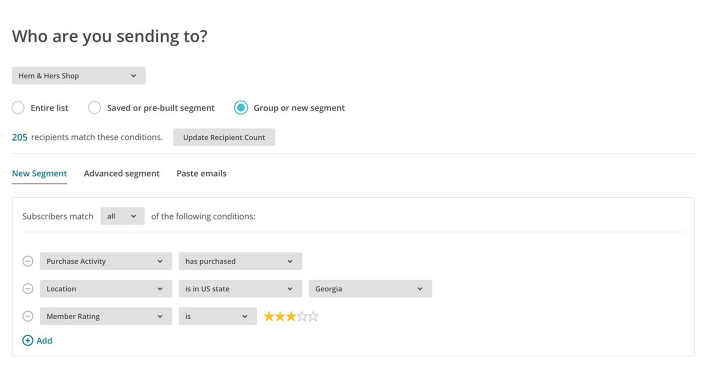 For example, based on your past data, you might choose to introduce your referral program to people who opened and clicked the last 5 Emails you sent. This way, you validate the idea that these people might want to see your referral program. Or, you could segment your customers based on their Lifetime Value and introduce your referral program to those with the highest Lifetime Value. Keep in mind that you have to offer something that will be tempting and that - at the same time - will feel easy to achieve. Women shoes Shopify store ZOOSHOO, ask their Email subscribers refer a friend and get $10 for every order above $40 placed by their friends. Would anyone bother sharing the link with their friends? Thus, if you choose to run such a campaign, use metrics like your AOV (Average Order Value) to determine the right amount. So if you want to make it right, give them a reason to refer your products. With 88% open rates and 56% click-through rates, Messenger is one of the most powerful marketing channels. Messenger is one of the most unexploited marketing channels up to date. This is why it's so powerful. And this is why you should use it to introduce your referral program to your ecommerce customers. Like with the 2 aforementioned tactics, you should validate the idea that the people you are sending to, would want to see your message and refer your products to their friends. Building a Messenger audience is, of course, important. Get this audience to open your Messenger campaigns and have them actively engage with your content is even more important. 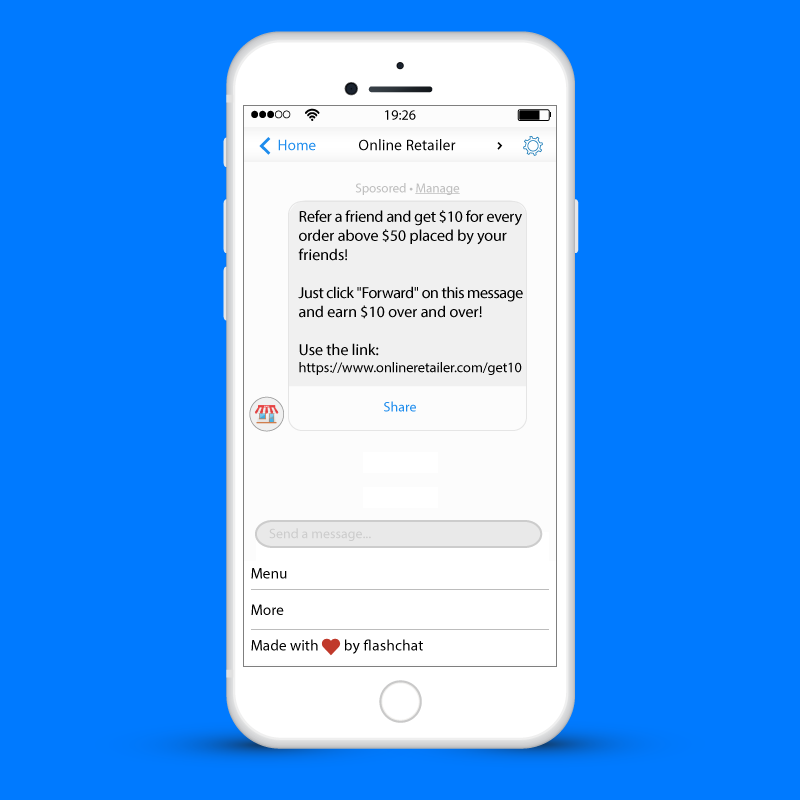 Thus, you have to send your referral Messenger campaign (if we could call it this way!) only to people who are engaged Messenger subscribers. This way, you increase the likelihood that these people will, in fact, refer your products. 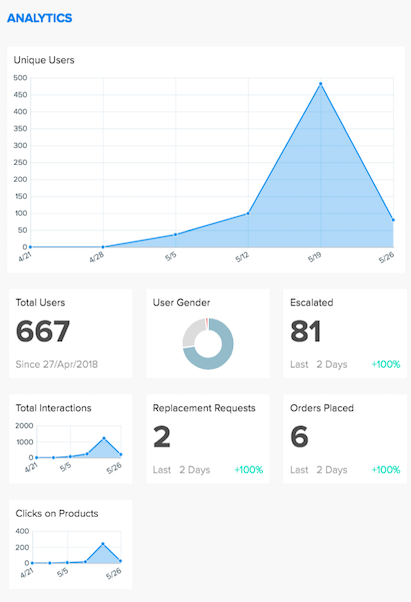 For this reason, you can use Flashchat, which is the first conversational commerce platform for eCommerce businesses. 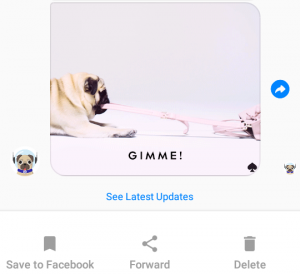 Through your Messenger Dashboard, you can segment your Messenger audience based on their behavior and send your referral campaign only to those who are highly engaged with your content. Another thing to consider is your message. 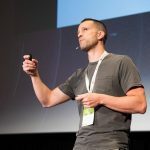 Like with the email campaigns, you have to show people that what you are asking them to do, requires no effort and- of course, has actual value for them. As you can see in the picture below, when someone sends you a message on Messenger, you can share that message directly with your friends and beloved ones. All you have to ask your customers do is to click on the “Forward” button and ask them to share the message with the people they want. And, who wouldn’t open a message on Messenger, especially when it comes by their friend or family? This is the true power of Messenger and this is how you can use it for your referral program. Like with every other marketing tactic, you have to cross promote for maximum impact. 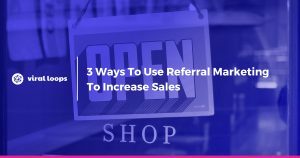 By the use of the 3 tactics we mentioned, you can introduce a referral program to your ecommerce customers for maximum engagement. Keep in mind that you always have to give first, in order to ask for something in exchange. Vaios Gkitsas is a serial entrepreneur with more than 15 of experience in world-class mobile marketing companies. Nowadays, he runs Flashchat.ai, an All-in-one Messenger Commerce solution for online retailers.